Super Adjustable Super Erecta shelves have the same weight capacity as Super Erecta, but with a patented shelf release that makes it easier to adjust and assemble. 24,36,42 and 48″ wide shelves have an 800# capacity per level and 54,60 and 72″ wide shelves have 600# per level capacity. All units have a maximum capacity of 2000#. Comes in Chrome, Metroseal, Stainless, White and Black finishes. Mobile unit: typical capacities are 600 – 900 lbs. (272 – 408 kg) and will depend on casters selected. Super Adjustable Super Erecta shelves have the same weight capacity as Super Erecta, but with a patented shelf release that makes it easier to adjust and assemble. 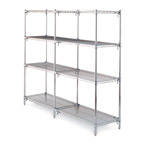 24,36,42 and 48" wide shelves have an 800# capacity per level and 54,60 and 72" wide shelves have 600# per level capacity. All units have a maximum capacity of 2000#. Comes in Chrome, Metroseal, Stainless, White and Black finishes.